Finally. Yesterday was snow-free. Beautiful blue sky. Comfortable temperature. The Colorado I know and love. Well, ok, I actually love the snow and all the fun things there are to do in it, but the last couple of months have been way too much of a good thing. I now have a major case of Spring Fever. 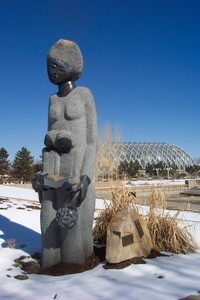 So, I went to the Denver Botanic Gardens. A light blanket of snow still covers the ground. 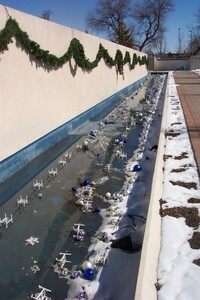 But ice on the little streams and ponds is now just a skim. And droplets of water from the snow melt are falling from the roofs of pagodas like tiny jewels. ... The tropical flora inside the conservatory hint at the thriving greenery and riotous color that will overtake all outdoors, the long summer days and the evening picnics and concerts to come. Can you just imagine lounging on these slopes when they are grassy and green, wiggling your bare toes in the soft blades, sipping something cool and listening to the sweet sounds of a chamber ensemble? ...The pergolas heavy with trumpet vines and wisteria? So please come quickly Spring! I was going to post one of these images for my Saturday Sky. But, I couldn't choose just one. And anyway, now it's Sunday. But today is equally glorious. 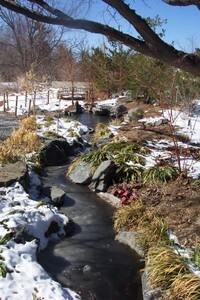 I hope you enjoyed the little stroll with me through the Gardens and the promise of Spring to come. 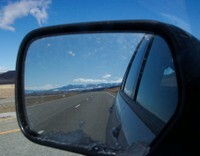 This was in my "rearview" on my last road trip -- Montana's Big Sky. I'm making good progress on the Simple Lace Shawl - at this point, all 367 stitches of it. It's been my travel project for the last few weeks. I am now beginning work on the lace border. Yay! I was afraid of lapsing into a garter stitch coma. The drape and subtle sheen of this Giada yarn is gorgeous. And finally, a big thank you to my good friend Patti from Sweetgrass in Helena, Montana. 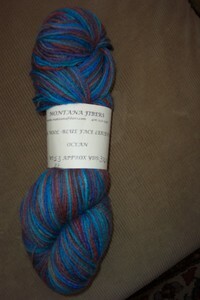 She gifted me with this lovely skein of her own Montana Fibers in a hand-dyed Blue Faced Leicester. The colorway is Ocean. The wool is gorgeous and has a beautiful soft hand.There are about 375 yards and it looks like it will work up to about 5 sts to the inch. This might make another lovely Forest Canopy shoulder shawl. Any other ideas? Happy Sunday - and Happy knitting to you! Hi! I didn't evaporate. I just returned from a looonnnggg road trip that took me into five states in eight days. In spite of my best intentions, there was no opportunity to blog before blowing out of town or while I was out pounding the pavement. But now I'm back, and in the immortal words of Dorothy, there's no place like home ... or anything better than all the wet noses and wags just waiting for me to get here. This weekend I went to the annual Denver Creative Festival. 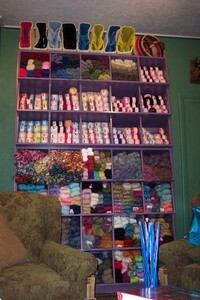 There's lots of needlework, sewing, quilting, knitting and crochet, and other kinds of crafty things to see. 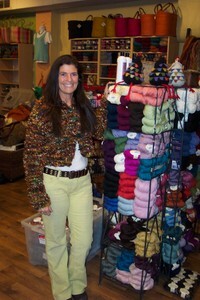 It's always great to visit local companies and designers like Cheryl Oberle, Interlacements , and Textiles a Mano. I especially look forward to making this event my annual pilgrimage to visit Canadian friends Anne and Eugene Bourgeois of Philosopher's Wool, who always have a magnificent exhibit of their extraordinarily beautiful fair isle designs and kits. 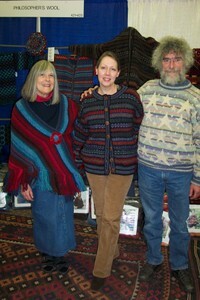 Here I am with Anne and Eugene, wearing the Philosopher's Wool Color Your Own cardigan I knit two years ago. The colorway is called Ilona. 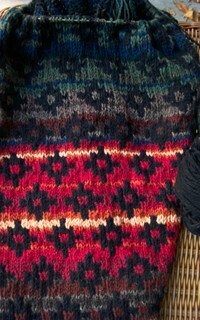 I love this colorway because it is such an artful blend of both warm and cool colors. I bought this beautiful Moving Mud glass shawl pin they were featuring this year. 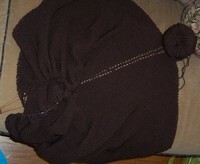 Anne is also wearing one on her shawl in a gorgeous deep red color. Mine absolutely looks custom made for my Garter Ridge vest I knit a couple of years ago from Cheryl Oberle's Folk Vests book. And it will enhance so many other pieces! I also bought some beautiful light and lace weight merino and alpaca hand dyed skeins from Textiles a Mano. I need to take a good picture of those, so will post them later when I get the projects planned. They are gorgeous. This is the Kilim Cross Shawl in the Hollyberry colorway (again, I love those warm and cool colors together--don't you?). I'm still working away on it. Spending so much time traveling really slowed progress once it reached that not so portable stage. But, I pick this lovely piece up at every opportunity when I'm home and always become newly inspired. It's in the knitting bag right next to the sofa, so never far from reach. I had hoped to finish by Thanksgiving -- yikes, ok so maybe before Spring arrives. With the weather we've had this year, I may just be able to wear it straight into July! I'm headed out again for a week. I'll be leaving for the airport right around kickoff time. So, while you're enjoying your guacamole and the big game, I'll be knitting at 30 some thousand feet. A perfectly acceptable trade-off IMHO. I'm not really a football fan (even if it is the Superbowl) - but I do look forward to watching the halftime show on my DVR. I love the artist formerly known as Prince - conveniently known as Prince once again! This pic is from the city of my destination today and was taken on my last visit there. Just never got it posted up then either, so I'll offer it now. It was bitterly cold after snowing the day before (what else would you expect - I was there). Just call me "Typhoid Cherry". You know, Mary's snow alter ego. I take snow with me and spread it around like an epidemic everywhere I go--lol. But the storm was clearing and a blue sky was peeking through. 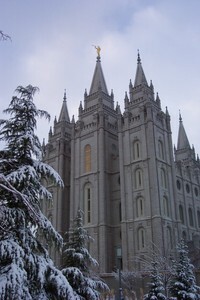 I had just time enough for a quick walk around Salt Lake City's Temple Square to take a few snaps and appreciate this magnificent architecture. I'll try to check in from the road, and will be back home next weekend for a couple of days before heading off again. Hope you get some good knitting done during all those touchdowns today! My first post of the new year - sorry it's so late. I had to run off on a road trip on January 2. And I'm off again! Just wanted to let you know I didn't evaporate. My Golden Retriever Humphrey has to have surgery tomorrow. And I won't be here. John will take care of everything, but I'm a bit of a wreck. So please hold some happy healing thoughts for my two and four-legged guys tomorrow...thanks and I'll be back soon. I don't know if it's epidemic, but something is definitely going around. I've got a case of it too. I acquired this "Foxy" in my recent travels in Idaho at Handmade. 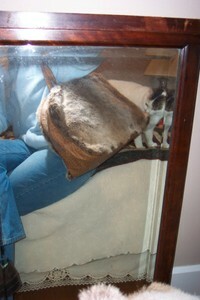 It's an Atenti bag of FAUX fox and FAUX ostritch (of course it's FAUX - remember I'm the one that won't even eat critters). The Atenti's are the creations of two Argentinian women and have lots of fun prints and textures. Anyway, Carol has a beautiful selection of the Atenti bags at Handmade in Eagle, Idaho. And check out their new digs - the move was in progress during my visit. Look! A whole wall of Louisa Harding! Thanks Carol - I really enjoyed my visit to the new store (she's looking fab in Online's (Linie 197) Zara jacket from the Fall 2006 collection) ! Here's the main reason I wasn't able to check in while I was out on this last road trip. It was like this for over 400 miles in western Idaho. I flew into the thick of that terrible storm that hit the northwest right after Thanksgiving - the same one that tragically claimed the life of James Kim. I managed to track with that storm all the way to Tulsa, Oklahoma as it moved eastward. I kept both hands on the wheel and only had a few white knuckled moments along the way. But I just had no energy to go find a keyboard to click while I was out on the road this time. It's good to be home! Another road trip - I'll be back in two weeks and will try to check in from the road. In the meantime, hoping you have someone warm to snuggle up with...it's getting cold outside! 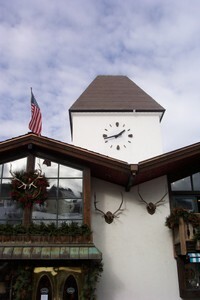 Vail, Rabbit Ears... to name a couple of the mountain passes I've traveled this past week. While you may be enjoying glorious autumn or even Indian Summer, the previews of winter finery are everywhere if you're near 10,000 feet. 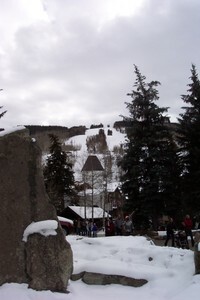 Vail Mountain - those runs are looking ready to ski! and a parting shot of the view from under the covered bridge before refueling at Starbucks, and then I was back on the highway for a few more hours of driving under lovely Colorado skies. Since I was on the road last Saturday, I wasn't able to post the picture of the lovely Saturday Sky I enjoyed in Tucson AZ. 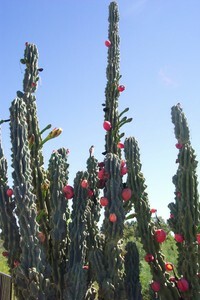 Here it is a bit belated and I hope you can see the little bird perched on this beautiful blooming cactus. Here's today's sky, and that's Castle Rock just south of Denver. It got really hammered with by the snowstorm this past week. It was in white out conditions. What a difference a couple of days makes. That's one of the reasons I love Colorado! Greetings from Tucson Arizona--land of desert, blue sky and the beautiful hills of Santa Catalina. Unfortunately, I spent the day working in my hotel room, but the view out my window is still lovely. I hear it's been snowing at home and ...heh heh heh, I'm in flip flops and a tank top. I've borrowed my Saturday Sky from the nice folks here in Tucson, but I've got no way to post the pic up here (I travel sans technology), so it will be a bit belated. I'll catch you up on my lovely Saturday sky from the road when I return home next weekend. 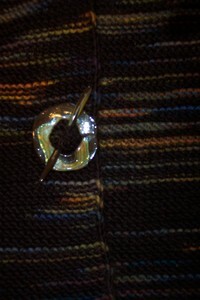 My friend Phyl's shared needle made its way home safely to its rightful owner. The Queensland Kathmandu DK sweater is traveling with me again on this trip and so far no crisis relating to needles to report ... yet. Happy knitting! I'm headed for the Lone Star State early tomorrow morning. I'll be back to home base in a couple of weeks. I'll try to check in here along the way. Happy knitting!